Thank you for having me for a guest, Ceri! I believe that Mr. Collins is, hands down, the most amusing character in Pride and Prejudice (perhaps all of Austen). Lydia, Mrs. Bennet, and Lady Catherine all have their humorous moments, but I don’t find them as laugh-out-loud funny. I’m not sure why. Perhaps it’s me. Perhaps it’s Collins’s unending stupidity. Perhaps it’s because he does no real damage to the protagonists in the story. When I set out to write Mr. Darcy to the Rescue it was to imagine what would happen if Elizabeth said “yes” to Collins’s proposal. But it also allowed me to explore other aspects of P&P that had always intrigued me. For one thing, Collins makes a great foil for Darcy, who doesn’t suffer fools gladly. One of the sad things about the original P&P is that Darcy and Collins don’t share more scenes together; so I added some and the results are explosive. I’d also wanted to write dialogue for Collins because he’s such an idiot. It’s almost impossible to go too far in writing over-the-top conversation for him. So that was great fun. 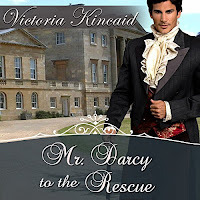 I hope my readers will also think the Mr. Darcy to the Rescue audiobook is great fun! Now as Elizabeth focused on his words, she had to stifle a laugh at the idea that his affection for her was violent or deep or anything more than nonexistent. In fact, he had not even managed to produce any “animated language.” Instead, he had merely assured her that his language was animated. It was a bit like having someone declare it was raining when you stood in bright sunshine. Oh, merciful heavens, he was still talking! “To fortune I am perfectly indifferent, and you may assure yourself that no ungenerous reproach shall ever pass my lips when we are married.” As he drew breath for another long-winded speech, Elizabeth knew she must say something—and quickly! “We do?” Elizabeth expected smoke to be streaming from her ears by now. “Yes, I have spoken with your most excellent father, and he assured me how felicitous he found this event.” He graced her with a smile, which presumably was intended to be charming, but oozed insincerity. “He did?” Elizabeth found these words hard to credit. Mr. Collins had been so caught up in the sound of his own voice that it took him a few moments to realize that Elizabeth was halfway across the drawing room floor. He hastened to catch up with her. The sound of this ridiculous pet name almost stopped Elizabeth altogether, but she had a more urgent mission. “I must speak with my father,” she muttered. Briefly, Elizabeth considered the possibility that Mr. Collins was so stupid he was incapable of being insulted. Elizabeth would be tempted to laugh if the situation were not so dire. Why would her father give Mr. Collins the impression he wanted her to marry him? You can buy the audio of this now! - Audible US / Audible UK. If you would like to read this but would prefer to read with your eyes you can do that too. It is available in ebook and paperback - Amazon US / Amazon UK. Oh,what a funny excerpt!! I actually think this version of Mr C. is actually so dense and incapable of processing any other version of reality,other than his own,that it's impossible for him to pick up the social cues that reveal he's being highly insulted!! I love to listen to audiobooks when I'm travelling to/from work and when I'm doing work around the house.I don't have a lot of audiobooks but I have a soft spot or the first one I treated myself to......yes! you've guessed it! P&P narrated by Joanna David,aka Mrs Gardiner from the '95 version! I just love it and have listened to it so many times that I practically know it off by heart and can narrate parts of it myself!! Best of luck with your new audiobook, Victoria. Hope it's well received! So glad you enjoyed the excerpt, Mary! I listen to audio books in the same way that you do, on my commute and doing housework, plus if the weather is good I try to get in a lunchtime walk when I often listen to a bit of audio. I have an audio of P&P narrated by Rosamund Pike (Jane in P&P 05) but I haven't listened to it yet. Loved the conversation between Mr Collins and Elizabeth especially the part where she says she’ll have to check her journal. 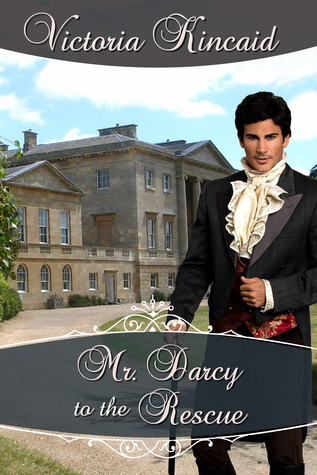 I look forward to his discussions with Mr Darcy too. I hope the next audio release will be Chaos comes to Longbourn. Great excerpt Victoria, I love your version of Collins. So dense, pompous and blind. Poor Elizabeth. I think dense and pompous must be fun to write and it certainly fun to read, but must be horrible to meet in real life! So thrilled to see this story in audio. Isn't it wonderful when a story you love turns up in another format, Becky! It's lovely to see you venturing into the audio format, Victoria. I've already used one of my Audible credits and listened to this fantastic story. That scene was funny on the page but listening to it on my commute recently had me laughing out loud! Fortunately, I wasn't surrounded by other vehicles at the time, so no-one was wondering what the crazy woman in the elderly estate car was laughing at. Looking forward to listening to more of your books on my travels. Obviously no need to put my name in your giveaway hat, Ceri. Lovely convefrsation between Elizabeth and Mr. Collins! I love the premise when Elizabeth has to see Darcy's value in contrast to Mr. Collins's character! I hope to read or listen to this story soon! That's very true, Agnes, Elizabeth can't fail to see that Mr Darcy has good qualities when compared with Mr Collins! Congrats on releasing an audio version of your book. I enjoyed reading the novel. Mr Collins is so presumptuous as to assume that Elizabeth will say yes to his marriage proposal. His actions and words do make us laugh at how stupid and dense a man can be. I think he needs a strong wife who can control, direct and guide him to correct his ways. Btw I am not a fan of audiobooks yet but I hope I can be persuaded to give it a try. I think that canon Collins is very lucky in his choice of wife, because Charlotte is clever enough to guide is behaviour without him being aware of it, and keep him happy at the same time. I hope you enjoy audio books when you try them. I never thought I could be converted, but I find them a wonderful use of time when my hands are busy.